Full disclosure: I’ve never read the Max Brooks novel upon which the new mega-budget zombie film World War Z was based. Nor did I follow any of the rumors and bad press about escalating costs, creative differences, multiple rewrites, and extensive reshooting. Pretty much the only preconceived notions I had going into the film were based exclusively on what I had seen in the trailers. From what I understand, for fans of the novel (as is so often the case), mileage may significantly vary. With that out of the way, I was gripped by World War Z from the chaotic initial zombie outbreak in Philly, all the way to the taut, understated climatic episode in Wales. Yes, it’s a PG-13 film so there’s very little blood and guts (The Walking Dead regularly gets away with far worse, and they air during primetime) but that didn’t bother me. Director Marc Forster relies on slow-building tension and unseen spookiness lurking around every corner. The zombies, moving like hoards of ants as they pile up on one another to scale walls, are plenty scary without being overtly gross. 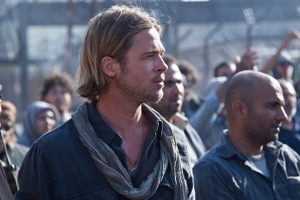 Brad Pitt stars as Gerry Lane, a formerly high-ranking U.N. official who is coaxed back to work after a global zombie pandemic of apocalyptic proportions erupts. His old boss and trusted friend Thierry (Fana Mokoena) promises to keep his family safe on a Navy ship in exchange for Gerry’s assistance in discovering the root cause. 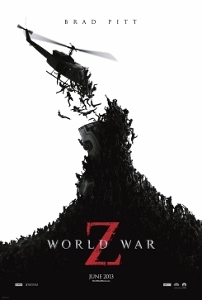 From that point, World War Z sends Gerry on an international search with a young doctor who specializes in viruses, Dr. Andrew Fassbach (Elyes Gabel). Dr. Fassbach explains that what they’re after is “bread crumbs,” little clues along the trail that will inevitably lead to the reasons the pandemic exists. But as a buddy picture, Gerry’s real partner in zombie-fighting turns out to be Segen (Daniella Kertesz), an Israeli soldier who – despite her slight build – turns out to be a valuable asset. 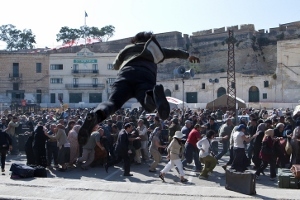 Are there problems with World War Z? Sure. There are hints of political turmoil and infighting (apparently far more detailed in the novel) that don’t really add up to much of anything. We get the backstory of the traitorous Gunter Haffner (David Morse), a man with great insight into the pandemic, but then only a single scene featuring the character. I also wish Mireille Enos (so great on AMC’s The Killing) had more to do as Karen, Gerry’s wife and inspiration to keep on battling. There seem to be a lot of pieces (presumably remnants of the novel’s various threads) that either aren’t fully explored or sometimes just abandoned. I guess that’s what happens sometimes when a movie is written by committee (in this case, four credited screenwriters), but as a white-knuckler, World War Z delivers. It’s refreshing (and almost startling) to witness a summer blockbuster with the good sense to scale back to bare minimalism for its final act, rather than pull out all the stops in an attempt to top its biggest set pieces (and this film has some pretty big ones). Could the film have cut deeper? Undoubtedly. Does Pitt’s Gerry Lane survive increasingly improbably accidents and injuries, sometimes with nary a scratch? Yep. But at some point during a summer already crowded with big budget snooze-fests, the question becomes: does World War Z provide two hours of sustained tension that justifies a visit to the theater? I say yes.